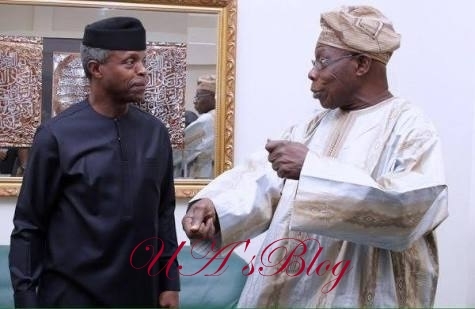 Vice President, Prof. Yemi Osinbajo on Tuesday met with former President Olusegun Obasanjo. Following pictures which surfaced online, Osinbajo was said to have had closed-door meeting with the former president in Ota, Ogun state. However, the Vice President has cleared the air on the said meeting. He noted that he met Obasanjo by coincidence at the Nnamdi Azikiwe Airport. According to him, there was no secret meeting between them and the Director General of the President Mohammadu Buhari Campaign Organization, Rotimi Amaechi. Osinbajo’s Senior Special Assistant, Laolu Akande said this in a post on his verified Twitter page. The post read: “Ignore reports VP Osinbajo alongside Minister Amaechi held meeting with former President Obasanjo in Ota.